If there is one thing that X-Men fans use to identify Betsy Braddock, AKA Psylocke, it’s her unfortunate costume, and if there’s another it’s her trademark psychic knife. 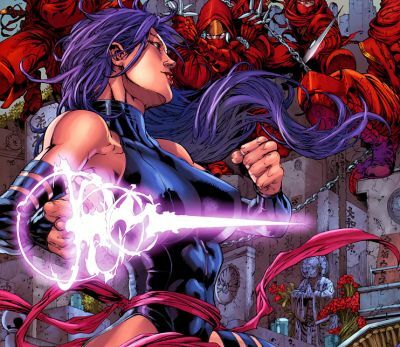 A concentrated point of energy from her psychic powers, Psylocke has used the weapon in combat countless times, and it’s going to be making its way to the big screen in next year’s X-Men: Apocalypse. We already got a tease of the blade itself when the film landed on the cover of EW a few weeks ago, but now in a new video of actress Olivia Munn’s stunt training, you’ll find a pre-CG version of the construct in addition to her other trademark weapon, a katana. Check it out in the player below! Michael Fassbender, James McAvoy, Jennifer Lawrence, and Nicholas Hoult are set to lead the cast of X-Men: Apocalypse as Magneto, Professor X, Mystique, and Beast. The film will also see the return of Rose Byrne as Moira MacTaggert, Evan Peters as Quicksilver, Lucas Till as Havok and newcomers Alexandra Shipp as Storm, Sophie Turner as Jean Grey, Ben Hardy as Angel, Tye Sheridan as Cyclops, Olivia Munn as Psylocke and Lana Condor as Jubilee. Oscar Isaac is starring as the film’s title antagonist. Writer/producer Simon Kinberg scripted the film from a treatment he wrote with X2: X-Men United writers Mike Dougherty and Dan Harris.